My grandpa, Claude Baker, used to love to tell jokes and stories. He was good at it and got so tickled when he finished. He used to tell a story about a dog named, “Love”, that went like this. 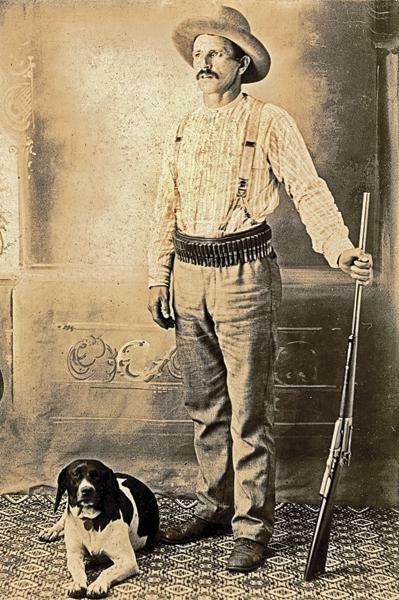 “A frontiersman was out hunting with his dog, Love. They were captured by Shawnee. The frontiersman knew that the Shawnees would kill him, but he also knew that they loved riddles. When he was brought before their Chief, he told him, “I wager my life that I can give you a riddle that you can’t solve. If you solve it, you can kill me. If you can’t, set me free.” The Shawnee Chief was interested and agreed. He told him that they would be back at the next dawn to hear this riddle. The frontiersman had bought himself some time, but he couldn’t think of a riddle. While worrying over his situation, his faithful dog could tell that he was upset and tried to console him. This gave him an idea. Although it broke his heart, he knew what he had to do. The next morning, the Shawnee returned. The Chief asked the frontiersman if he had a riddle for him. He said that he did and began to recite it. Love I see in yonder tree. I googled a riddle about a dog named love and found this. My grandmother used to tell myself and my cousins riddles and this was one that I remembered her reciting to us often. So crazy to actually be able to find it on the internet. She’s been gone about 15 years or more now. I miss her and her riddles terribly.